Hullam Hostel was built nearly 100 years ago and it stands in the heart of the town of Revfulop. Revfulop is situated on the north shore of the lake on the boundary of the Balaton-Highland National Park and the Kali Basin. You can see the whole lake from the nearby tower. The town is famous for its excellent wine, its sports events (e.g. swimming across Lake Balaton) beaches and ancient trees. This hostel is a great base in and out from Budapest or the Adriatic Sea. 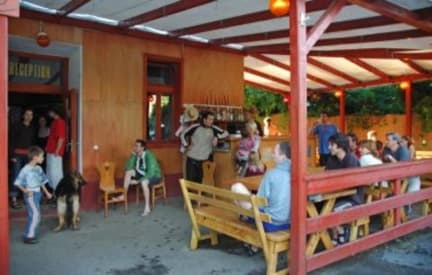 If you are curious to discover this unique region of Hungary and to meet locals or to taste the local specialities (in music, food, customs) then this hostel is probably the best choice for you. We usually have live music bands ( folk, jazz ) on the evenings and cooking together on open fire is quite common, too. There are several local festivals around and we provide up-to-date info about these. If you need some privacy the other day then you can read or have a nap in a hammock back in the garden. You can rent a bike at your disposal on the spot. The nearby Kali basin is a true paradise for bike lovers with its beautiful surroundings and rare fauna. The lake is ideal for sailing and swimming, too. There are 2 local beaches to choose from, both are a few minutes walk from the hostel. You can also go horse riding in the neighbouring village of Kovagoors. All at exceedingly modest prices! Thank you so much for a nice stay!! Great place to stay in Balaton very close to the beach. The staff is incredibly friendly and will go off their way to help improve your stay. They offer as well bikes to rent, which allows to enjoy the landscape and location to the maximum. I hope I get to come back again! Brilliant hostel in a beautiful place. Staff are friendly and very helpful, they're keen to give advice on things to do, places to go, cycle routes to take. Hostel bar is very reasonable and serves lovely local wine. Kitchen is small but usable. Would highly recommend this hostel. 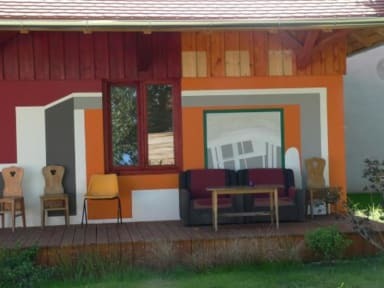 Great hostel in a great part of Lake Balaton! Staff are very friendly and helpful, the hostel is close to both the Lake and the train station. Révfülöp is a great base to explore the north coast of Lake Balaton. walking distance from train station and lake. Great location. We had a great time staying here!! :-) It's really close to the lake and there is a bar in the hostel, what more do you want? There was only one key for our dorm which was a bit complicated, because you would have to get the key at the reception every time you need something from your room. Also you have to trust others to lock the room. I especially enjoyed going swimming in the lake after the bar closed, but be wise and careful! Would definitely recommend this hostel. This is more a place for groups and school classes than a hostel. But it's on a great location and all facilities and the train station very close and in walking distance. A good spot of you want to spend a few days at the lake. The owner went out of his way to ensure me and the other guests were comfortable, warm enough and knew what we could do in the nearby areas. However, as it was low season it was very quiet in the town and hostel (as I expected). It was quite cold and I especially found it hard that there were no indoor communal areas, the kitchen and eating area were both outside and it was extremely windy during my stay so I couldn’t really cook my own food. In summer this place would be perfect and lively. + Helpful staff, they've good bikes for rent. Also nice bar downstairs with good coktails and live music on fridays - Not enough bathrooms in the case the hostel is full, not enough frequent cleaning of bathroom. Really small toilletes and no light in it... in the room there were no courtains - in the early morning is just too bright to get a good sleep, also in the night because of the light on the street. But overall hostel was just fine for the price paid.